New Year's Eve in the Philippines is December 31st of each year. 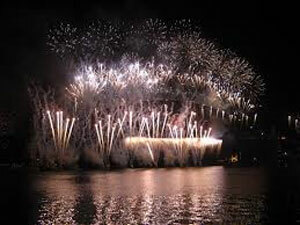 The celebrations are extensive and include fireworks, parties, food and drink and much more. Many people will attend a firework show and enjoy parties with their family and friends. Some of the more traditional celebrations include beating pots to scare away evil spirits, honk horns, open all their windows and doors to scare away evil spirits. Many will go to evening mass as well. New Year's Eve celebrations in the Philippines go way back hundreds of years and is difficult to know when the first celebrations took place.